This fantastic 600+ page guide is chock full of useful information. 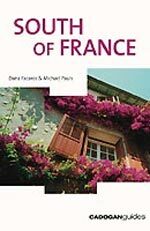 Whether you are experienced or not with the south of France, this publication has information on everything you might need including passports and visas, banking, and maps. Some of the highlights of the guide include information for disabled travelers, a calendar of events and festivals, and information on all sports available in the region both for spectators and participation. The guide also contains chapters formulated specifically for cuisine, history, art and architecture. The authors of the book divide the south of France into eleven individual regions. Each region is subdivided by city and offers advice on the best places to stay, dine, and shop. Also practical detailed information is given about the main attractions in the area. The index at the back of the guide is particularly useful for finding precisely what you are searching for. "What a pleasure it is to find an intelligent guide book that is actually fun to read." "Good writing, amusing comment, invaluable advice"